B' e stàit air a stèidheachadh air aonadh pearsanta an Rìgh a bh' anns an Aonadh Kalmar (Danmhairgis/Nirribhis/Suainis: Kalmarunionen, Laideann: Unio Calmariensis). Chaidh a chruthachadh ann an Kalmar ann an 1397 tro aonadh Rìoghachd na Danmhairge, Rìoghachd Nirribhidh agus Rìoghachd na Suaine. Chruthachadh an t-Aonadh Kalmar air sàilleabh gu robh cunnart ann gum fàsadh an Lìog Hansa na bu chumhachdaile ann an Lochlann agus thar na Mara Baltaich. Cha b' e aon stàit a bh' ann, ach trì stàitean - agus an cuid cholonaidhean - fo stiùireadh aon Rìgh. B' ann ann an Halmstad a rèiteachadh cò a bhiodh na Rìgh. Cha do mhair an t-Aonadh Kalmar o chionn 's gur robh coimhearachd ann bho uaislean na Suaine. Ged a bha an stàite ann fad 126 bliadhna, thathar a' fàgail air nach robh ach a' chaoile ghorm a bh' ann. Bhris an t-Aonadh Kalmar a-mach às a chèile ann an 1523 mu dheireadh thall, ged a lean Nirribhidh fo buaidh na Danmhairge gu ruige 1827. Cha b' urrainn dha na Rìghrean an t-aonadh pearsanta atharrachadh gu stàit aonadach. B' e sin a bha aig cnag na cùise ann an còmhstri eadar an Danmhairg agus a' Phrùis fad an 19mh Linn. Ghabh an t-Aonadh Kalmar a-steach sgìrean mòra anns a' Ghraonlainn, ann an Suòmaidh, anns an Ruis, anns a' Ghearmailt, ann an Innis Tìle agus - a bharrachd air Arcaibh agus Sealtainn ann an Alba. 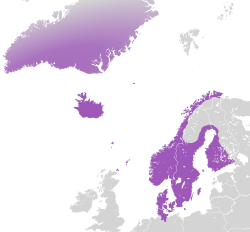 Air a tharraing à "https://gd.wikipedia.org/w/index.php?title=Aonadh_Kalmar&oldid=517219"
Chaidh an duilleag seo a dheasachadh 5 dhen Ògmhios 2016 aig 04:46 turas mu dheireadh.